I was recently asked by my good friend, Robyn from Simply Fresh Dinners to to participate in the latest Blogger's Writing Tour circulating now. I am so happy she thought of me. Thank you sweet Robyn for including me on this journey. It basically works when a blogger answers four questions about their writing process and then nominates two or three other bloggers to carry on the tour. Robyn and I met online a few years ago when I found her food blog and was hooked on her healthy and creative recipes. Robyn is all about healthy, fresh ingredients and delicious! She loves to create yummy recipes that are low in calories, and are not time consuming. We have become great friends and we chat on a regular basis. 1). What Am I Working On? One of the main things I am working on is to remain healthy. I am a three-time cancer survivor. I hope there is a cure one day soon. 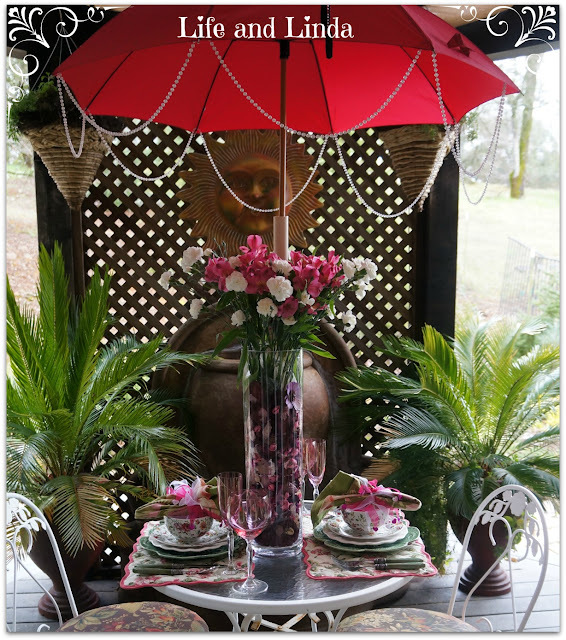 I love to entertain, garden and set a beautiful table. I enjoy themed tablescapes, therefore I am creating some right now for future posts. I want my guests to feel special when they sit at our table. Trying new recipes is always fun and it's great when you make something that you absolutely love. I was recently inspired by a beautiful Salmon salad I saw a picture of. I am getting that post ready to share the recipe. Another interest is blog design. I feel comfortable designing Blogger blogs...to give bloggers a great design that reflects them. I have been working on a few blogs and also tweak some. Some of my followers have given me the name, My Fairy Blog Mother. Unfortunately that name wasn't available, so I chose A Blog Fairy, in which I have my second website. 2). How does my work differ from others of its genre? I am working to achieve well written posts to inspire my followers and anyone else reading my blog. I am not sure how different it is, because there are so many talented bloggers out there. I pride myself with being an all around blogger....meaning I write about food, sharing recipes I love.....Creating fun themed table settings ,my love of gardening....Decorating and of course Blog designs. 3). Why do I write what I do? I write as I do to share and inspire others. Blogging is all about sharing experiences, whether it is food, decorating, gardening, crafting plus many more things. Sharing is caring and we all can inspire each other with our many talents. For instance, when I went through two cancers again last year, I chose to share my experience, my feelings, and my surgery through my blog. It helps to write down your feelings. When I wrote the post on Etiquette for cancer, you can find it here. I wanted to give some insight into those who don't know what to say or do. I also write tutorials to assist other bloggers, so you can say, I love to share. Just living everyday life gives me plenty of inspiration. have a fabulous meal at etc. Re-working recipes to make them different and delicious. and create away. Taking my thoughts and putting them on this blog and adding photos completes the process. It's my time to nominate a few bloggers whom I admire. Here are two bloggers I admire their special talents. beautifully decorated food and decor. She definitely has the knack for design. It's always a pleasure to visit and see what Jacqueline is up to. I have to add, I designed her blog as well. is such a talented writer. She creates beautiful posts with lovely images, some animated and of course her captivating poetry. She will charm you with her well written posts. Anita is a French teacher as well. Her words will take on on a journey of no other. Please take the time to visit these lovely ladies. Wow, I didn't know you have gone thru cancer 3 times. I pray there will be a cure for cancer too.......and soon! This was a lovely post, nice to get to know you a lil better. I always enjoy my visits to your blog and have also seen some of your wonderful blog designs on others blogs. Like Nellie, I was shocked to read you have beaten cancer three times! There's a lot to be said for a strong will and faith! Thanks for sharing more of yourself in this post, it was great to learn some more about you. Oh Linda, how WONDERFUL! First of all, that fabulous office is a place to dream and write for sure! Thank you kindly for nominating me and I will look forward to providing a post at the end of the month as you know, I do go back to teaching on August 25, but August 18 is when I start to prepare. Oh, there is so much to be said about my writing process! I look forward to sharing. BLess you dear friend! Oh, I also appreciate your process because it is ALL ABOUT sharing and caring. Without those two components in blogging, it would not be the same for me. It's all about the people behind the scenes that make this experience so great. Linda, thanks for sharing more about you and your writing process. I participated in the "Tour" this week as well. It's fun to know more about our blogging friends. You are definitely one who cares and shares. I so appreciate you thoughtfulness and friendship. Both Jacqueline and Anita are friends and favorites blogs to visit. Great choices! I'm eager to read what they will share. Oh, and in case anyone is wondering Linda is the best blog designer, she did my blog over and I love it very much. Come check out her work. You are so talented in so many areas and I'm proud to say that you are my Fairy Blogmother and that I've been able to talk to you on the phone. You're just the sweetest, kindest person. I, as you know, pray for a cure for cancer and for you, everyday. Hugs sent to you. I've seen this same tag on several other blogs and am so glad that no one has nominated me. I have absolutely no writing process other than sitting down and just writing! I very rarely plan them out in advance, and it probably shows. Oh well! It was interesting to read about your writing process though. My father passed away of cancer three years ago. I hope that there will be a cure one day too. I've heard it said by many people that there already is a cure, but that the drug companies and medical professionals wouldn't make any money if they provided cures to everyone. I don't believe that though. If I had that Ballard room in our home, you would NEVER see me out in the light of day again!!! Gosh, that's pretty!!! So well put together!!! This has been fun learning about various bloggers in Blogland! I wish I could have participated. It would have been neat. That was a nice post Linda. I was asked to do this too about a month ago but I passed on it. I have the same philosophy for my blog. That's nice that your good friend Robyn has inspired you so much. It's nice to have someone you relate to!